No one goes looking for the Hill of the Stone ... that I know of; well mostly. Because well sure ... it's barely there. If you're on a bagging mission or the telly is crap, you might find yourself on its shoulders, hovering over the upload route to mvs button but the irony is you may already have clambered over its hairless back many times before, to/from Commedagh the Watching Hill to/from Bearnagh the Gap Hill and so busy watching and not seeing, that the gap had been filled with Slievenaglogh. If there is a noticeable change of rake, either up or down, it's not noticed by you because behind and in front are the objects of your mission. Bigger objects. Much bigger. By comparison, not even sure if I would call it a hill. Still .... it has been described to me as the most beautiful place in the Mournes. Quite a handle given that fairly well everywhere is the most beautiful place in the Mournes. If the title of this organ is anything to go by, something that seems to have fallen by the wayside over the years - mountains: views from them and views of them - there would be something to commend the Hill of the Stone. It is honest pleasant, decent and unassuming. From every one of the 360, it gives you a sensational run home if that notion takes you. And best of all, now you know where it is. Start - as from Plan A: Commedagh or Bearnagh. 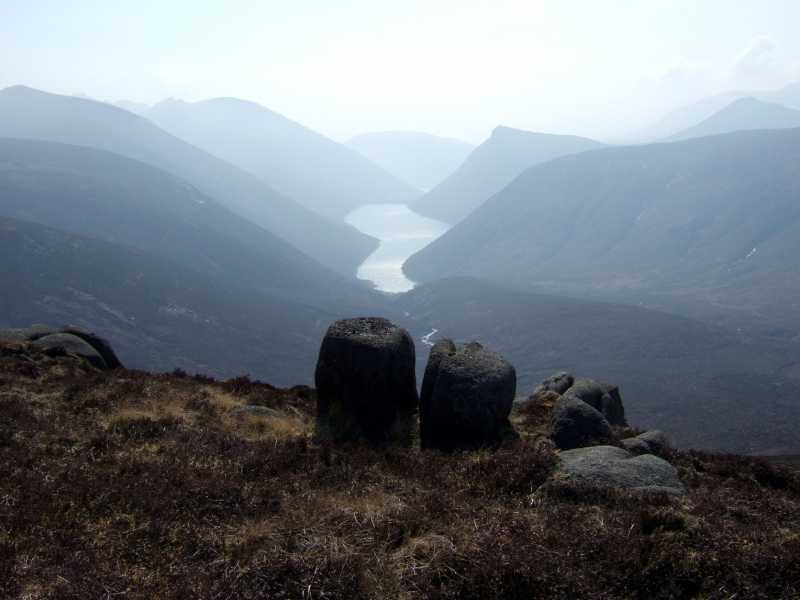 Alternatively pick up a track from the Trassey River or from the head of the Crom reservoir.